Pancakes are traditionally a breakfast food, but there is nothing wrong with having them for lunch, or even dinner. My previous post listed many of my breakfast recipes with corresponding links to its posts. 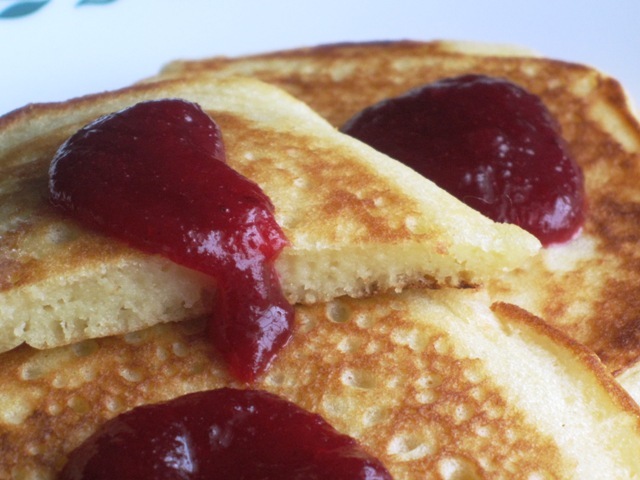 Today I will share a recipe for very fluffy pancakes, served with a rather non-traditional topping (my homemade Apple Orange Cranberry Sauce, which I usually make for Thanksgiving). This recipe yields 12-16 medium size pancakes. I served mine with homemade Apple Orange Cranberry Sauce....delish!! These pancakes are at their prime taste while hot, but just as moist and delicious the next day, warmed up in the oven or toaster oven. In a large bowl, whisk dry ingredients (flour, salt, sugar, baking powder). In a medium bowl, mix the milk, egg yolks, and vanilla extract. Blend in the melted butter. Start heating a frying pan, electric pan or griddle to medium temperature, and season it with cooking spray or 2 Tbs. of canola oil. In a small bowl, beat the egg whites until soft peaks form. Using a spatula, gently fold egg whites into the batter. Place 1/2 cup of batter onto a preheated pan, for each pancake. Cook until bubbles form on the surface of pancakes. Flip over, and cook another minute, or until golden. Best served immediately, with your favorite topping, or maple syrup.